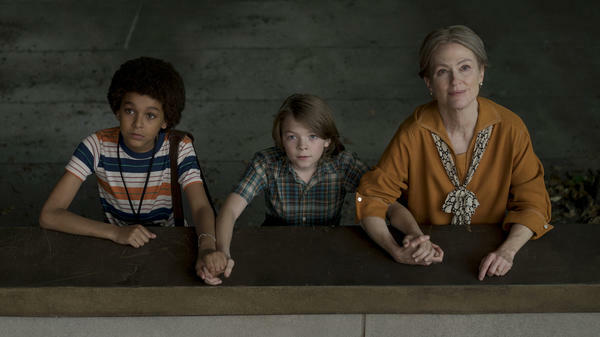 Jamie (Jaden Michael) and Ben (Oakes Fegley) meet ... a woman played Julianne Moore (no spoilers!) in Todd Haynes' Wonderstruck. Todd Haynes may not have been at the top of anyone's list of potential kiddie-movie directors before Wonderstruck, but the movie does dovetail with several of the filmmaker's previous projects. Scripted by Brian Selznick from his own novel, Wonderstruck invokes David Bowie and Oscar Wilde, two of the muses of Haynes' Velvet Goldmine. The story is set mostly in New York in two decades, the 1920s and the 1970s, that neatly bracket the time and place of Haynes' 1950s drama, Carol. The film alternates between a pair of timelines, the first rendered in a black-and-white cinematic pastiche that recalls one story in Haynes' narrative triptych Poison. The making of dioramas also figures in the movies themes — vast creations spiritually akin to the Barbie-doll world Haynes constructed for Superstar: The Karen Carpenter Story. So Wonderstruck offers much to occupy the eyes and minds of movie buffs and Haynes fans. Yet there's little room left for insight and emotion in this overstuffed cabinet of curiosities. The film isn't as inert as Hugo, Martin Scorsese's paralytically pastel adaptation of an earlier (and similar) Selznick fable. But its taxidermied scenario never comes to life. The movie opens in 1977 in small-town Minnesota, where Ben (Oakes Fegley) is having a nightmare. Ben can hear, but soon lightning strikes and he loses that ability. Then comes a hop to 1927 New Jersey, where Rose (Millicent Simmonds) is living with a dad who's unsympathetic to her deafness, and almost everything else about her. Both children are 12 and motherless. Ben's mom (Michelle Williams) died recently in a car crash. The whereabouts of Rose's mother is one of the mysteries to be solved. Another is the identity of Ben's father, which his mom never revealed. The kids each decide to visit New York City. Based on a tattered bookmark, Ben guesses that his father works at a Manhattan bookshop. Rose goes to see a stage performance by her favorite actress (Julianne Moore), whom we see in a movie modeled on a Lillian Gish damsel-in-distress melodrama. Among the children's cross-generational links is the American Museum of Natural History, a grown-up version of the improvised archives Rose and Ben have assembled in their bedrooms. Rose's much older brother works at the institution, and the penniless Ben finds shelter there, thanks to a kid (Jaden Michael) who has, improbably, colonized an abandoned gallery. There are even more invisible threads that bind Rose, Ben, and the museum. Eventually, and exhaustingly, the story shifts to Queens and another museum piece: the panoramic model of New York City built for the 1964 World's Fair. While both stories are contrived, Ben's is livelier. It's shot in '70s-style color, with harsh reds and murky greens, and powered by funk, disco, and glam-rock. The depiction of a still-ungentrified New York is overly lurid, but at least it's not as mummified as the treatment of the city in 1927. Wonderstruck's simulation of flickering silent cinema is both precious and unconvincing, without the genius of such aficionados of the form as Guy Maddin. Haynes cast several deaf actors (including Simmonds), but the film fails to sell its notion that the arrival of the talkies ended a golden age for deaf moviegoers. Eventually, the mystifications disperse. Ben meets another character played by Moore, and learns the secret of his father, which proves anticlimactic and unsatisfying. Then lightning strikes again. The result could be chaos, but not in Selznick's clockwork universe. Wonderstruck's mechanisms turns all stories, and all feelings, into specimens to be exhibited behind glass.